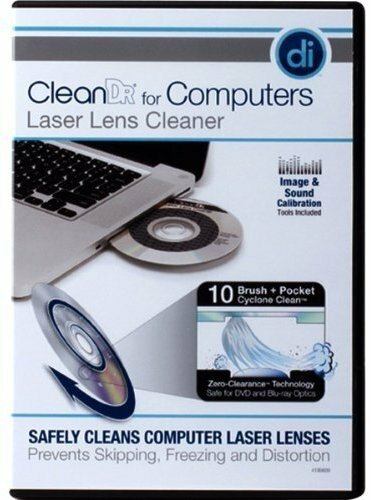 CleanDr for Computers Laser Lens Cleaner removes dust, dirt, and debris from the laser lens of your computer drive helps maintain the life of the device while improving image and sound playback. The CleanDr for Computers Laser Lens Cleaner features our 10-brush Cyclone Clean Process. The brushes are arranged in a spiral pattern on the disc for quick and effective cleaning of the laser lens. The CleanDr for Computers Laser Lens Cleaner includes instructions in English, French and Spanish as well as exclusive Image and Sound Calibration Tools. Works in all computers with DVD or Blu-Ray Drives (not compatible with CD only CD-Rom drives). Works with DVD/Blu-Ray Players, XBOX/XBOX 360/XBOX ONE, PS/2/3/4. Not compatible with CD only drives or other CD players. If you have any questions about this product by Digital Innovations, contact us by completing and submitting the form below. If you are looking for a specif part number, please include it with your message.